We have a busy night on the ice on Tuesday with 10 games on the schedule including two that have a massive 6.5 Vegas Total. The other notable thing is that all 10 of the top offenses are in action so we can expect a high-scoring night. Let's dig in and take a look at some of the top plays at each position. Then grab a copy of my DFS NHL Cheatsheet where I highlight all of my top plays with advanced stats. The goalie position is a bit of a mess tonight so I am going to start by paying right up at the top with Frederik Andersen. He has been terrific lately going 8-2 in his last 10 games with a .938 save % and what has is more impressive is that he is facing a whopping 37 shots per game in that time good for an average of 7.3 DraftKings/28.3 FanDuel points per game. He now leads the league with 15 wins on the season and is third among qualified goalies with a .931 save %. The matchup doesn't jump off the page as the Sabres rank just outside the Top 10 in overall offense but they are one of just two teams playing on a back to back and with their 31+ shots per game it gives Andersen a high floor and ceiling making him a top target in all formats. I mentioned the mess at the goalie position above and this is one of the main reasons why. Dubnyk is one of the best goalies in the league but struggling big-time with four straight games where he has allowed four goals against. The good news for Dubnyk is that he gets an elite matchup tonight against the Canucks who have also struggled a ton lately losing 11 of their last 12 games while scoring just 2.08 goals per game. There is definitely no way I would consider Dubnyk in cash games but the upside is there in this matchup that he is a top GPP play tonight. I normally leave the obvious plays out of my articles but MacKinnon literally checks every single box and I want to make it clear to those who are new why. First of all, this game is one of two tonight with a massive 6.5 Vegas Total so there is literally no better place to start than the top performing line in the NHL this season. MacKinnon has been on an absolute tear lately and it starts with the high floor as he is averaging over four shots per game in his last 10 games then add in the sky-high ceiling as he has eight goals and 19 points in that time and now sits 2nd overall(43) behind his linemate Rantanen leads the league with 45. Looking at the matchup, the Penguins have struggled a ton lately losing 12 of their last 16 games while giving up 3.6 goals per game and are without their starting goalie Matt Murray. 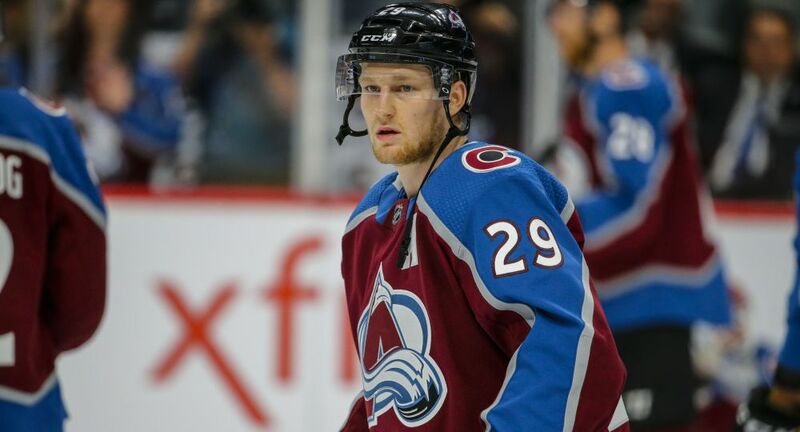 MacKinnon is an elite play and despite his high price, there are enough value plays to build around him in all formats. If you are looking to go a little more balanced in your lineup, Max Domi is a player that stands out tonight in the other game that has a 6.5 total. He is having a terrific season with his new team with 27 points in 27 games and while he has trended down with just six in his last 10 games, he has seen an uptick in shot volume with 28 in those games. What really stands out tonight is the matchup as the Habs will be at home against an Ottawa team that may have won three straight but ranks dead last in defense(4.04 goals against per game) and have been much worse on the road allowing over five goals per game. Domi is the 15th in pricing on DraftKings and 20th on FanDuel making him a terrific PTS/$ play in all formats. If we are going to be building around MacKinnon tonight, we are going to need some value in our lineups to make it work and Kyle Connor fits the bill. He skates on the second line with the red-hot Patrik Laine who has 14 points in his last 10 games and hasn't been too shabby himself with 11 in that time but it's his floor that stands out as he has 34 shots in that time. Looking at some advanced stats, he sits with an above average 15.6 iCorsi/60 and an elite 4.61 high danger scoring chances per 60(league average - 2.3). At these prices, he is in play in all formats. DeBrusk has been held off the scoresheet in three straight games but it doesn't worry me much as he continues to get a ton of opportunity with Patrice Bergeron out of the lineup. He has averaged over 18 minutes of ice-time over his last six games and while the offense has been lacking(12 points on the season) there are signs we could see some positive regression as he is averaging 5.6 high danger scoring chances per game. The matchup also stands out against the Panthers who rank 29th in defense so, at these prices, he is in play in all formats and helps us get to MacKinnon and/or other elite players tonight. After missing close to a year of action due to an injury Shea Weber is back on the ice and has picked up right where he left off. In his first game, he led the team with over 25 minutes of ice-time picking up and assist with three shots and two blocks. The next two games were very similar where he averaged the same ice-time and he also scored his first two goals of the season. He is the Habs top D man and now gets an elite matchup against the Senators dead last defense. The best part of it all is that his price is hovering under $6K on both sites making him my top play and safe in all formats. For value, I will once again turn to Ian Cole of the Avs as his price has drifted back down below the $4K range on both sites. He lacks upside with just eight points on the season but has provided us some nice PTS/$ value for cash games as an elite shot blocker. He has 28 over his last 10 games and 79 on the season which leads all players. He is a staple for me in cash games to help get multiple top-tier players in my lineup and will even consider in GPP's for the same reason.